Once a week I walk about three miles from work to a choir rehearsal downtown. I enjoy the nice long walk, but it’s still a long way after a full workday: by the time I get to the rehearsal space I really want a snack. There’s a Potbelly Sandwich Shop right nearby, and so I play a game with myself: if I can keep up a good pace so that I actually have time to duck into Potbelly, I get to have a Dream Bar. 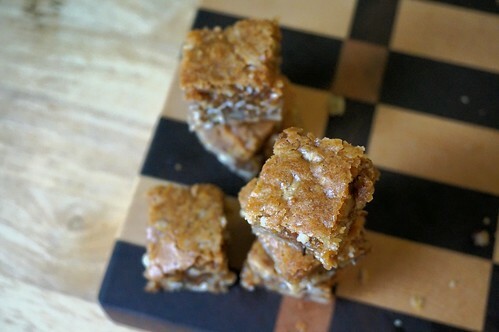 Dream Bars, for those unfamiliar, are a holy mess of a bar cookie, a sort of kitchen sink of sweet madness. But… here’s the thing. Sometimes I have to stay at work a little longer than I’d like, and I’m pressed for time. Or, worse, sometimes I win my self-inflicted challenge, but Potbelly is out of Dream Bars. Not to mention that it turns out that I’m not a very harsh taskmaster, so win or lose I still feel like I deserve my treat — and not just on Wednesdays when I’m a fast walker. That’s where this recipe started, but it went on to bigger and better places. If it were an essay, I’d say that the Dream Bar needs some editing: there’s too much going on for my palate. 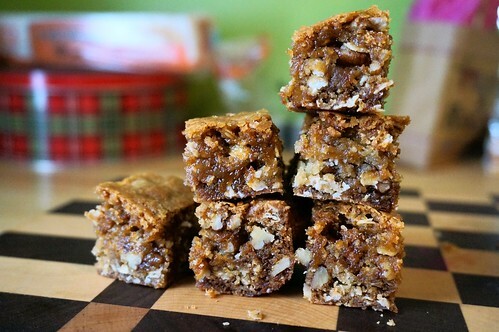 There’s a butter cookie base enriched with oats, masses of chocolate chips, and a big caramel swirl. All of these things are delicious in and of themselves, but when you put them all in the same place it mainly mainly ends up tasting like sugar. We can do better than that! So the oats made the cut, but they still needed a friend. The oats give an almost savory depth, and since I made a salted milk caramel instead of Potbelly’s taffy apple fudge (…no, I don’t know what that is, either) the caramel swirl has some bitter richness, butI still needed something to bridge that gap. Enter the pecan: king of nuts, if you’re from the South like me. 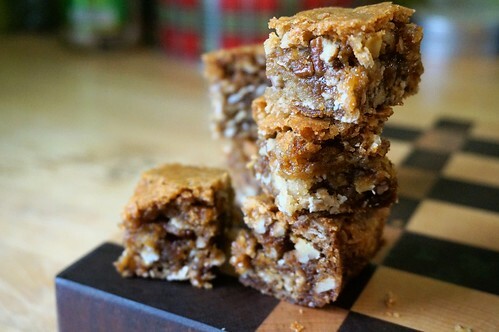 They’re full of flavorful oils, they have just a touch of brown toastiness to begin with, and they chop up nicely into little shards of nutty goodness. As soon as I cut into the bars, I knew I had a winner. Just be warned: if you bring these to work/school/a party, you may find yourself inundated with requests for more. These little bites are small but mighty. They may look like they’ll leave you wanting, but then you do the math. Butter + oats + caramel sauce + pecans? That’s a lot, and a plate of these is guaranteed to make a party full of very happy people. Or one happy person sneaking another out of the tin at midnight, which is how it usually goes in my house. And that caramel sauce? You’ll have some leftover to drizzle on, well, everything. 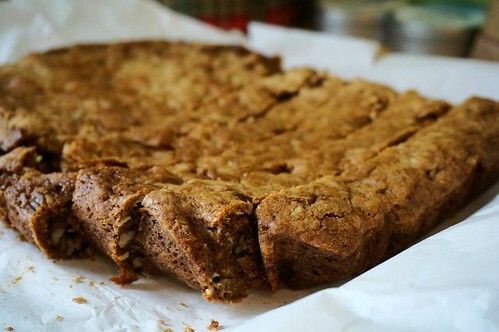 With inspiration from The Comfort of Cooking’s Soft ‘n Chewy Chocolate Chip Cookie Bars and Nestlé’s Original Tollhouse Chocolate Chip Cookies. In a large saucepan, heat the sugar over medium-high heat, stirring occasionally with a spoon or whisk. The sugar will begin to clump; this is normal, and eventually it will begin to melt. 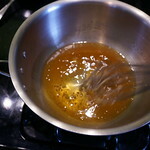 Continue stirring until all sugar is melted, and the melted sugar turns a light amber color. Immediately add the butter and whisk to combine (it’s okay if a little melted butter continues floating on top, but it should be mostly incorporated). Add the cream and stir to combine. (Be careful: the caramel will bubble and hiss dramatically when you add the cream.) Cook for about a minute, then remove from heat. Set aside to cool until lukewarm, at least 15 minutes. 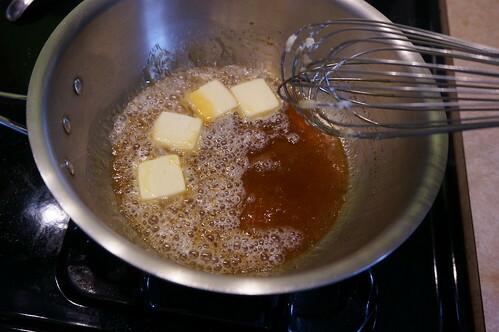 In a large bowl, combine the melted butter, both sugars, eggs and vanilla; whisk until the mixture lightens slightly. 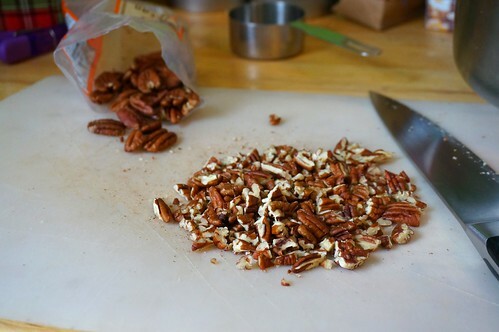 In another bowl, combine the flour, oats, baking soda, salt, and pecans. Add the dry ingredients to the wet ingredients, and stir to combine. The mixture will be very thick. Add a 1/2 cup of caramel sauce to the dough bowl in two portions. 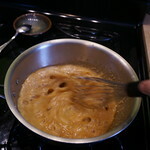 (Dividing the sauce helps to leave some pockets and swirls of caramel.) When you add each portion of sauce, stir to incorporate the sauce, but don’t try to make it all even; again, we want some swirls. 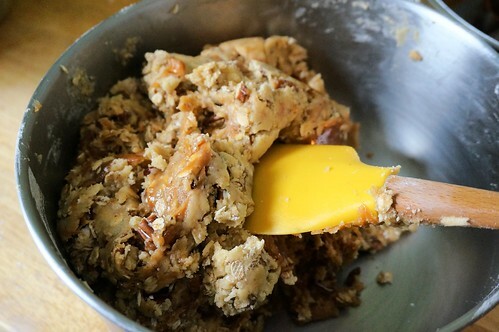 Turn the dough out into the prepared baking dish, and use your fingers to press it into an even layer. Bake for 20-25 minutes, until the center of the pan is no longer wet and the edges have begun to pull away from parchment slightly. Pan size: If you don’t have an 8×11 inch pan, you could make these in the more common 9×13 pan. In fact, that’s what most bar cookie recipes call for. (I went for the smaller pan because I find it aggravating to have to spread the dough out that far, and I like the thick cubes of cookie I get this way.) If you do use the larger pan, you’ll want to keep an eye on the bars to make they don’t turn crispy; twenty minutes is probably the upper limit, and I’d check at 15 or 18. 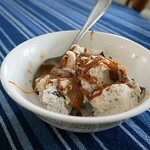 Storebought caramel: The caramel sauce is way more simple than you might expect, so I encourage you to try it out, but you can absolutely use a store-bought caramel sauce. Look for one that comes in a jar and is fairly goopy at room temperature, rather than a thin squeeze-bottle version. … But it does make a difference in what you do with the leftovers. See, you’re going to have about a half-cup of leftover caramel sauce, and oh my goodness. That stuff is — it’s — woof. It’s crazy good. And you could do all sorts of things with it: drizzle it on popcorn, dip some apples in it, eat it with a spoon. But my favorite thing is drizzling it on ice cream, and here’s where the butter content is crucial. A batch with 6 Tbsp of butter thickens on the ice cream, but is still identifiably a sauce. A batch with 4 Tbsp of butter turns into a hard candy coating. Fortunately, I like caramel candy, so I’ll eat it either way. But honestly, if you’ve got the two extra tablespoons around, just go with the full amount of butter. You’re already making a caramel sauce; this is no time to be persnickety about fat. Chocolate chips: And yes, of course you can add chocolate chips. I’m a contrarian, but who am I to stop you: go big or go home, right? These look amazing! It was lovely to meet you at the Books That Cook panel today, I am looking forward to taking your course next semester. Lovely to meet you, too! Let me know if you try these out; I hope you enjoy them.